This analysis warns of the growing risk of armed conflict in the Korean Peninsula and sets out some options for avoiding it and proceeding towards an agreement that would enable the precarious stability of the region to be underpinned. 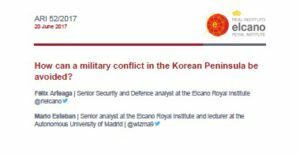 Military tension is nothing new in the Korean Peninsula. North Korea has been responsible for numerous armed incidents in recent decades; that these did not escalate is due to the fact that the conventional military superiority of South Korea and its US ally contained North Korean bellicosity. The containment scenario is no longer valid as North Korea’s nuclear and missile programmes have steadily progressed and now the Korean Peninsula finds itself in an unstable situation where any error of judgement or impulsive move could provoke not only armed conflict but also nuclear escalation. In a context marked by the problems faced by the international community to contain North Korean proliferation and by an increase in hostile declarations and the deployment of forces, this analysis sets out the need to adopt dissuasive and tension-reducing measures that could, first, avoid aggravating the current situation and, secondly, make progress towards freezing proliferation at its current levels and constructing a negotiating framework that would make it sustainable. Download the full publication in English by Félix Arteaga and Mario Esteban here or the Spanish original version, here.